School is back in session, fall is on the horizon and it won’t be long before we see those first snowflakes – eek! All the more reason to keep those summer activities going while we still can! September in Kamloops is a premium month for golf and with 7 full size courses to take advantage of, it is definitely too early to put those golf clubs away. Many would say that September brings the optimal weather for golf, and I would have to agree! Soak in that warm afternoon sunshine while enjoying that fresh crispness in the air. Not too hot, not too cold, just right to tee it up a few more times. Golf courses are in tip top condition this time of year. Fairways are lush and greens are smooth, not to mention the summer crowds have gone home so you are guaranteed to find a tee time at your favourite track. September brings us back from vacation mode and into a more regular routine. Grab some friends, check out a local men’s or ladies’ night and make an afternoon of it. There’s still time to fit in a quick 9 after work and maybe pick up a few prizes! Finally, did you cross off all the local golf destinations from your summer bucket list? Award winning golf courses Tobiano and Talking Rock are must-plays, and Kamloops Golf & Country Club is truly a hidden gem. Now is the time to tour the diverse set of golf courses that Kamloops offers. Whether you prefer a park or desert course, a classic links or a resort style, we have it all. World class golf is at our finger tips and it’s time to get out there and enjoy it. Grab your clubs and tee it up – you won’t regret it! 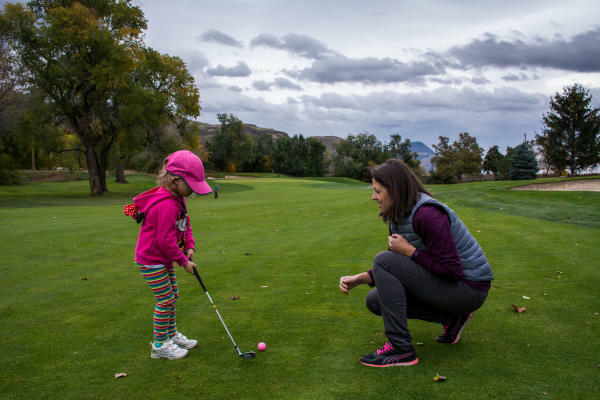 Pictured above, Lindsay MacDermott and her daughter hitting the course at Kamloops Golf & Country Club. Guest Post written by Lindsay MacDermott, local golf professional.